SEAT is driving forward its rich motorsport heritage with the SEAT Leon Eurocup; once again providing fascinating customer sport action starting with the 2014 season. On six race weekends in six European countries and with attractive prize money. On the grid will be the SEAT Leon Cup Racer, a first-class motorsport machine with 330 PS / 243 kW and an extensive array of professional technology.“Motorsport is deeply embedded in our brand. SEAT has more than 40 years of history here. With the SEAT Leon Eurocup, we offer an interesting opportunity for our motivated customer teams and our enthusiastic fans all over Europe,” says Dr. Matthias Rabe, Vice President of SEAT S.A. for Research and Development. “The Leon Cup Racer is an extremely high-performance race car. The new generation of the SEAT Leon provides an excellent basis for this, winning high praise from customers and motoring journalists alike.”The SEAT Leon has already been one of the most successful race touring cars of recent years. In 2008 and 2009, it won the WTCC title for SEAT Sport, while the SEAT Leon Supercopa and Eurocup was one of motorsport’s most popular One Make Series. The Supercopa championships ran from 2003 until 2013 in a total of 8 countries and the Eurocup from 2008 to 2010 in a total of 9 countries.With the SEAT Leon Eurocup the Spanish brand is contributing to this great tradition. A total of six race events will be held in six European countries. The exact race calendar will be defined over the next few weeks. Each weekend will run from Friday to Sunday and includes two free training sessions, qualification and two races. Winners can also look forward to attractive prize money.“With the SEAT Leon Eurocup, we are delighted to be able to offer our customer teams a great series for the 2014 season,” says Jaime Puig, Head of SEAT Sport and responsible for the brand’s motorsport activities. “The SEAT Leon Cup Racer is an excellent vehicle and will thrill our fans with some fascinating competition. The entire know-how of SEAT Sport has gone into the SEAT Leon Cup Racer. We are following on from the great sporting successes of years past.”The new SEAT Leon Cup Racer cuts an impressive figure from the outset – its muscular stance on its 18-inch wheels derived in part from a track that is almost 40 centimetres greater than on the series-production model. The new front end has been designed for optimum aerodynamic efficiency and maximum airflow to the engine and brakes. The substantial wheel arches, with their vents at the rear, enhance the cooling effect on the four-piston brake system. The powerfully flared sills work together with the front spoiler, smooth under body, rear diffuser and two-stage roof spoiler mounted on a single support to provide maximum down force for high cornering speeds.Nevertheless, the SEAT Leon Cup Racer fully retains the Leon design DNA – the distinctive full-LED headlamps with their individual daytime-running-light signature have been carried over from the series-production model, as have the LED rear lights. The contour of the roofline is also that of the series-production model, likewise the characteristic lines and precise blisters of the side view.Systematic weight reduction defines the interior, which is protected by a high-strength roll cage. 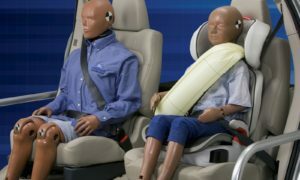 Optimum safety is also provided by the bucket seat with HANS system for head and neck protection. The basic form of the series cockpit has been retained, although the driver information and operating controls for the race car are focused on the multi-function steering wheel and the high-resolution TFT display behind it. This layout ensures that the driver always maintains maximum control of his racing machine.The Leon Cup Racer is driven by the mighty propulsion of a two-litre, four-cylinder turbocharged engine. Its maximum power output is 330 PS / 243 kW, while its maximum torque stands at 400 Newton metres. Power transmission to the front axle is courtesy of a 6-speed DSG dual-clutch gearbox operated from the steering wheel, and an electronically controlled locking differential.A preliminary purchase price for the Leon Cup Racer has already been set at € 70,000 (excl. VAT). The first official orders for the Cup Racer can be accepted as of the end of November. BMW M Performance parts for the new BMW X5.